Walled Garden at Holkham Hall01328 710227work GardenThe impressive 6 acre, 18th Century walled garden is being restored and the Victorian glasshouses have been renovated with the help of English Heritage. There is an opportunity to see the work as it progresses in order to bring the garden back to all its glory. 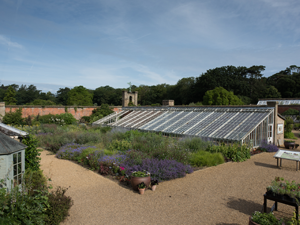 The impressive 6 acre, 18th Century walled garden is being restored and the Victorian glasshouses have been renovated with the help of English Heritage. There is an opportunity to see the work as it progresses in order to bring the garden back to all its glory. 1st April - 31st October 2019. Open every day 10am-5pm.